contributions to the restoration of health - naturally. homologous neural connections communicating intimately throughout their life. will be low in the blood. 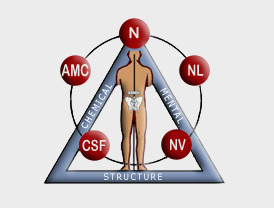 All these features are summarised in the diagram at left..
linkage - TMJ mechanism, an imbalance in the meridian system or a host of other problems. to restore function defines the diagnosis very accurately. other sources and experience, all this, helps direct therapeutic care to a patient's individual needs.